﻿Historically, one of the most quoted, used and abused SEO metrics was ranking. It is a cornerstone of reports that are sent to clients, one of the first things we go to check for clients’ sites and usually cause of alarmed phone calls when the ranking drops. Over the time, SEOs have learned to steer away from rankings as the major reported metric, although I have yet to find someone in the industry that doesn’t check them. Another exercise that we like to engage in is predicting how much traffic ranking in the top 10 will bring to the website. It quickly became obvious that not every position in the top 10 brings the same amount of traffic. It is quite self-evident that the positions 1-3 will bring more traffic than positions 7-10 but how much more? Effort involved in pushing the site from #5 to #2 can be significantly larger than effort to bring the site from #50 to #10, so is the traffic/conversions worth the effort? For this need, people have started investigating how the traffic divides across the top 10 locations. There were several methods used in these investigations, the two most prominent ones being eye-tracking and averaging clicks over locations data that comes from analytics or search engine/ISP (mistakenly) released data. I have reviewed a number of such studies and their predictions varied: the first 3 positions get in the neighbourhood of 60-80% of clicks, while the rest divides over the positions #4-#10. You can already see how the data in these studies shows a high degree of variability – 60%-80% is a pretty wide range. Different people mean different things when searching and shorter the query, wider the scope of possible intentions is. We can be pretty sure that someone searching for [online pizza order NY] is looking to order dinner tonight, but person searching for [pizza] may be searching for a recipe, in which case a pizza joint with online ordering website located at #1 will not get the recipe seeking clicks, which will either perform a second search or browse deeper into the SERP and on to 2nd, 3rd page of results. If the majority of searchers are looking for a recipe, then the #1 located pizza vendor will most definitely not get 40-50% of clicks. We have seen this happening with one of the clients that was ranked at #1 position for a single word keyphrase. 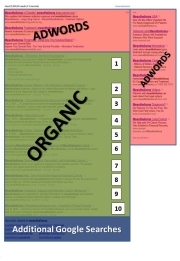 Google Adwords Keyword tool predicts 110,000 exact match monthly searches in the US. During the month of May, while being ranked at #1 at Google.com for that keyword, the site received about 7,000 US Organic visits. That is 6.36% CTR on a #1 position. Google Webmaster Tools shows a 10% CTR on #1 position for that keyword. Compare that to 50.9% CTR that the eyetracking study from 2008 predicts for #1 position, which means site located at #1 should be receiving around 56K monthly visits and you can get a feel for the gap between the prediction and reality. The problem with guessing intent of single query keywords is that it cannot be done before reaching any significant traffic creating positions and that task can be enormous. Low CTRs on the first position also put the whole perceived market value of single keyword exact match domains under question – the predicted amount of traffic that is expected from reaching top locations for the EMD keyword should take into account the difficulty to predict the intent of searchers. 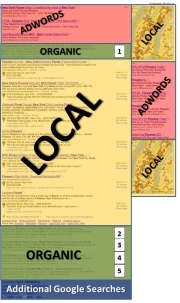 The SERP for this keyword has no local results nor universal search (images, videos, news). Pay attention to the difference in numbers between the original #3 traffic and the later #3 traffic. 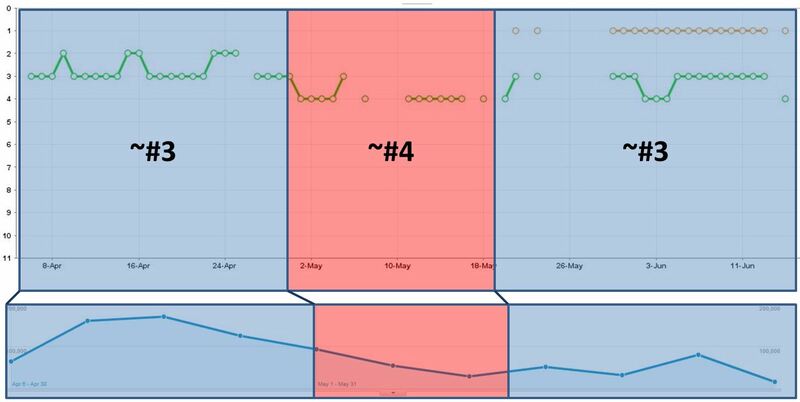 The initial drop to #4 cost this site 76% of the original traffic (instead of 30% as the CTR studies predict) and the return to #3 got it back to about 47% of the traffic the site got when at #3 originally. So what happened? The site got outranked by a famous brand. 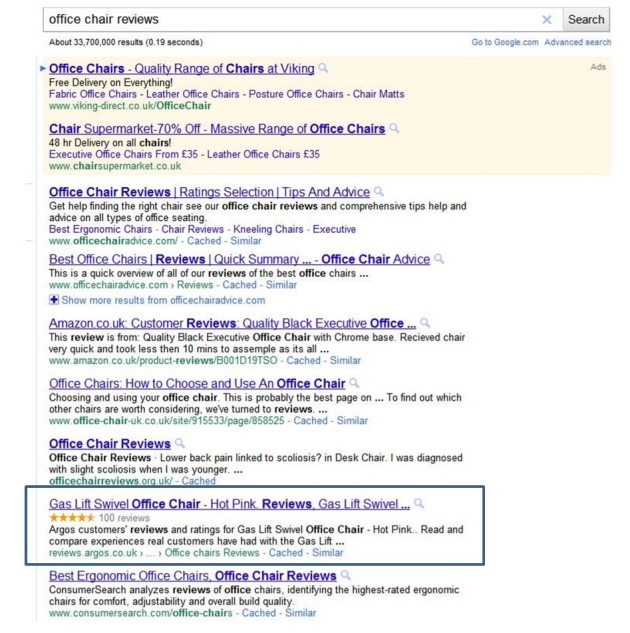 Seeing the brand name in the title and and URL of the #1 listing, enticed searchers to click through that listing in much higher numbers than the 42% that the study predicts. Again, it is not only where you are ranked, it is also who is ranked with you that influences your CTR percentages. My guess is that even when a big , well-known brand doesn’t outrank you, but is located just below your listing, your CTR percentages will also be negatively affected. Seems like Google’s preference for brands is based in actual user behaviour. It would be interesting to see whether there are any significant differences in bounce rates from brand listings too. 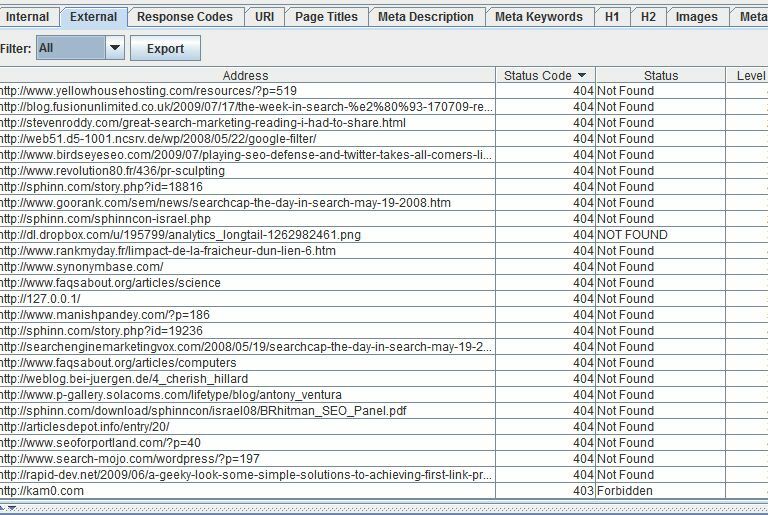 Meta Description – In an eye tracking study, performed by a team including, among others, Google’s Laura Granka, (published in a book called Passive Eye Tracking, in a chapter Eye Monitoring in Online Search) it was found that the snippet captured the most attention of the searchers (43% of eye fixations), followed by the Title and the URL (30% and 21% of fixations respectively). The remaining 5% distributed over the other elements of the listing, such as Cached Page link. This finding shows the importance of controlling the content and appearance of your snippet for your main targeted keywords, as an eye-catching snippet can tip the scales of CTR in your favour and increase the number of clicks you get, relatively to your site’s ranking. The showing of review grade stars in the snippet itself, makes this listing more attractive than the neighbors and it probably increases the CTR far beyond the few percent that the position #6 would get it, according to CTR studies. Similar situation can be observed with other microformatted data, such as event dates, recipes, airplane tickets, etc. Rich snippets will become even more widespread if and when Google starts accepting websites that implement the Schema.org tagging. Optimized Titles – adding a call to action to the Title or making it stand out in some other way, can increase the CTR percentages of a listing, beyond what you would usually get due to your ranking. This strategy, however, became less influential since Google started deciding what the best Title of your site should be, according to, among other things, anchor text of incoming links. As these changes will be implemented within Google’s discretion, it becomes very hard to predict how many people will click through to your site. These are only some of the reasons that CTR % can differ greatly from the value predicted by the eyetracking or other studies. It is important to remember that as search engines try to index and incorporate into SERPs more and more types of results, it will be harder to predict the CTR over locations. Even averaging out the figures over a large number of results will give us a number that is not at all useful for predicting the traffic volume received from each position. In the past few years, we have seen a flurry of articles celebrating the forthcoming death of SEO (AKA linkbait) and an even larger flurry of angry rebuttal articles from the SEO community (AKA retweetbait). One of the responsibilities I have in the new company is to organize a weekly list of recommended reading and send it out to everyone. I have been getting good feedback about these lists and since I am already doing them, I thought it would be a good idea to put them up on the blog. Obviously, not everyone will agree with the importance of the posts i put up here and they will not be new for everyone, but I thought you will enjoy reading the stuff that has kept me interested for the past week (or so). I will also add a short commentary to each link, sometimes referring to related articles, sometimes arguing the points made in the article, if nothing else then just to make it less of a regurgitation of someone else’s content that we see too often on the web. Rand seems to be having quite a bit of time on his hands lately, so he writes these epic posts, summarizing a lot of basic SEO data. 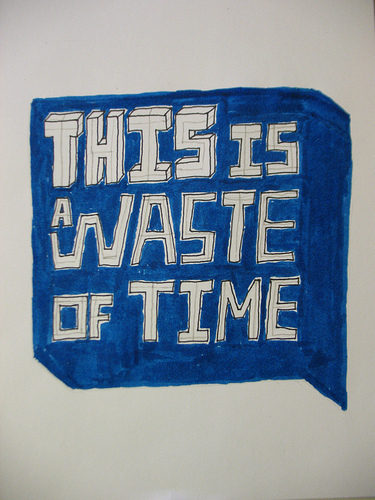 This one describes 17 possible ways that search engines look at links. While some of the statements in the article could be argued (like the way search engines treat nofollow), all in all it is a keeper. This post actually complements above Rand’s post very nicely – if Rand is looking at how search engines evaluate every single link, Bill Slawski provides a “high level overview” on how the search engines may classify links and understand the linking structure of whole websites and groups of websites. And he discusses the search patents related to his observations. To quote Michael:”While there are hundreds of thousands of posts on maximizing external links for your blog, like a red headed step child no one pays much attention to internal links.” The more successful your blog becomes, the internal links will have more impact on your rankings. You better take care of it early. How to create posts that get their content updated without using the link love that the original content acquired over time. This is an issue that gets neglected a lot by the blog owners who usually cringe at the thought of someone scraping their content. Michael shows not only how to encourage them to do so, but also how to make sure you reap the most benefits out of scrapers to score links. Includes mentions of plugins that help you with the job. 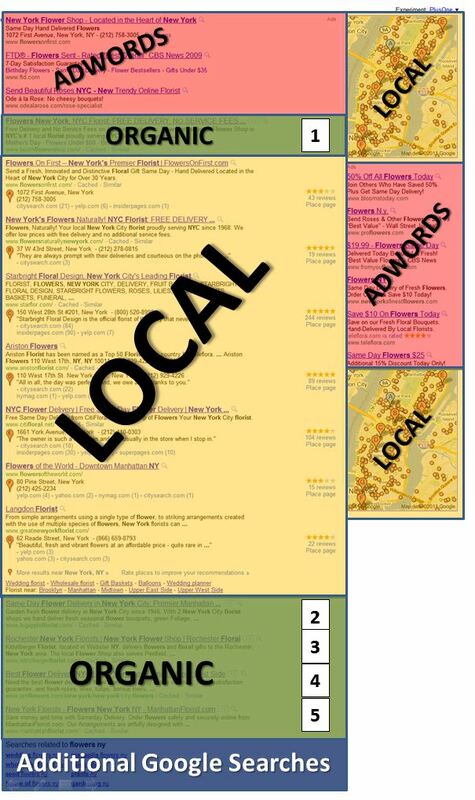 Directory submission is largely considered to be an SEO tactic that belongs in history. Debra Mastaler explains why this is an unjust generalization and gives some guidelines how to do directory submission right. Every once in a while Google comes out with a new feature in Webmaster Tools that makes webmasters’ lives much easier. Whenever that happens, you can bet on Vanessa Fox writing up an extensive review of the new feature on SEL. 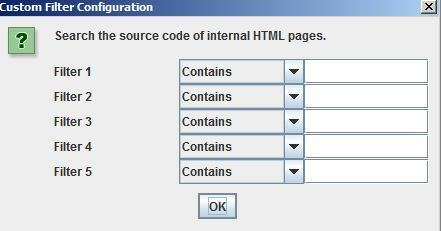 This time it is about Google enabling webmasters to define which URL parameters Google should disregard. This is something that was usually done through URL rewrites, robots.txt, canonical tag or other options that usually involved a webmaster changing something on their site. It seems like Google wants to enable webmasters to control the ways a website is being crawled and index without making those on-site changes. In addition to presenting the new WMT feature, Vanessa presents all the other options for URL canonicalization and their pros and cons. OK, this is not an SEO article but I thought it was interesting enough to make the list. This article gives some tips on how to put your LinkedIn profile to better use. Besides having a potential for being an amazing traffic source, LinkedIn should play a very important role in everyone’s personal online identity management. Read this article. While the Title of this post suggests that the reader will come out with a clear preference of one over the other, the result is actually quite different: the article explains how those two marketing tactics can feed into and support each other. One of the first signs that tell me that a website has been SEOed is a dissonance between the keywords featured in the metatags and the rest of the content. While being an SEO flag for me, it can be a serious turn-off for your visitors, affecting conversion rates, bounce rates and what not. This article gives some guidelines on how to align between your keywords and your content. 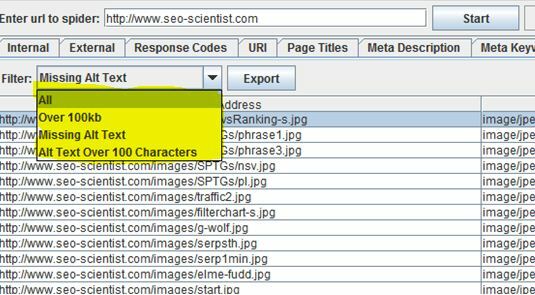 A short post with a great chart explaining all the inns and outs of how the search engine bots crawl and index pages and what are the differences between these two processes. 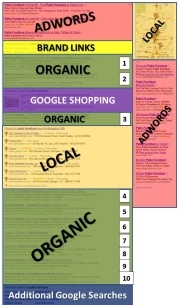 A great review of all the factors that can influence your geotargeting on search engines. Clears up a lot of terms and reasons why your rankings can vary between different countries. Following SEOs and engaging them in conversation on Twitter is an invaluable tool. Really. Cannot-put-a-price-on-it kind of tool. While not everyone on that list is an SEO, I went over it and I have already been following 90% of the people there, meaning that they were already providing real SEO value to the conversation. 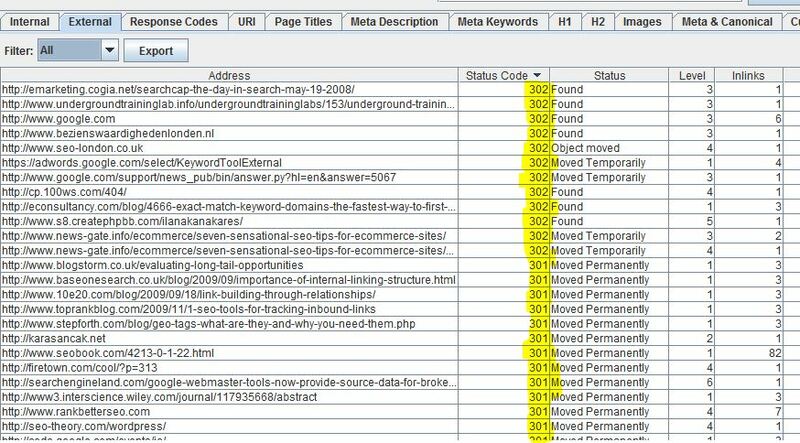 When beginning a new SEO campaign, a crucial first step is the keyword research. As a part of this step, one wants not only to find a comprehensive list of keywords that could serve as a potential target markets on Search Engines, but also to be able to predict amounts of traffic that each keyword will bring to his site. 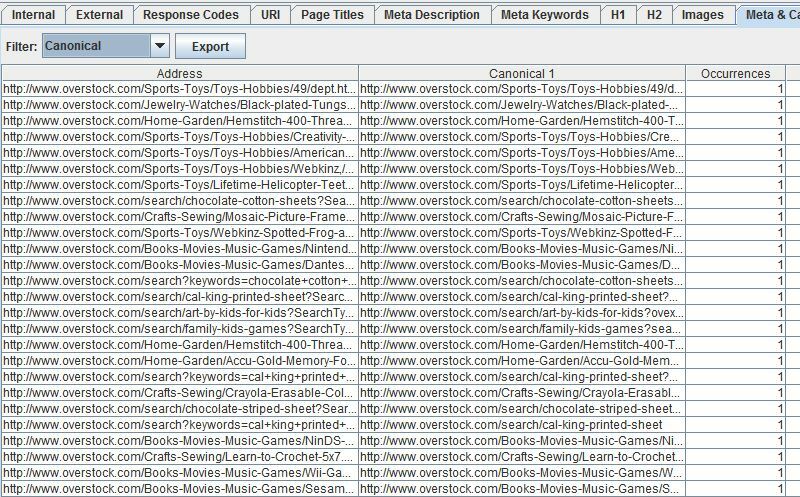 So we usually turn to different keyword prediction tools that provide us with this kind of information. Obviously, the most popular such tool is Google Adwords Keyword Tool, but there are others – Google Search Based Keyword Tool, SEMRush, Spyfu, Wordtracker MSN Excel based addon (check a great review and tutorial on SEOMOZ about this one), etc. When we look at these tools, we can see only a single value for each keyword, representing a predicted monthly number of searches performed for that keyword on search engines. However, there are important issues that need to be taken into account when considering this data: what position will bring that amount of traffic ? Can the change in title (such as adding a brand name, special characters, call to action, etc.) increase the amount of traffic that the site gets from a current position ? How do Universal Search Results affect the percentage of traffic I get from the 1st page of Google SERP ? In order to be able to consider these issues, we need to be able to estimate the percentage of traffic that each position will bring. 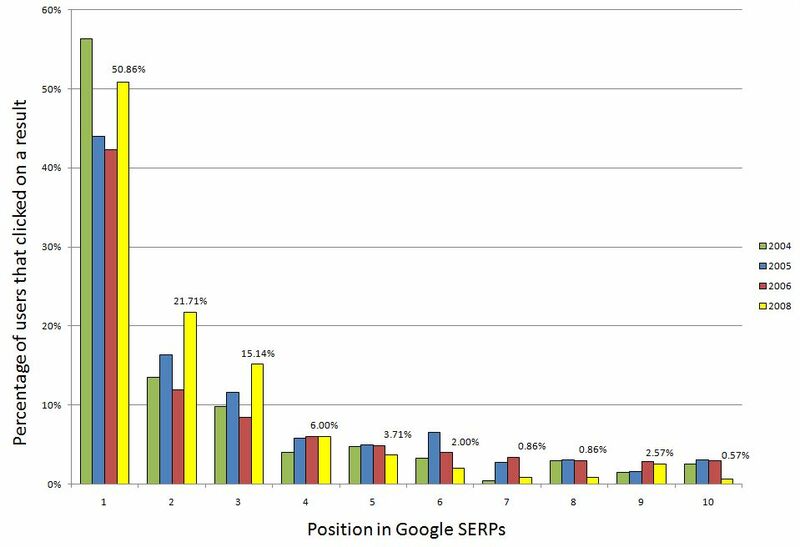 Now, when reading about the importance of getting to the first page on Google, there is one piece of information that always gets quoted: 90+% of users do not go past the first page of SERPs ( I don’t know who was the first to come up with that statistics, so I will just link to this SEM article). While being probably true, this statement creates a misconception that if we do succeed and get our site to the first page of results, we have managed to achieve exposure to those magical 95% of users. I am sure that many people rationally understand that this is probably not the case, that each listing in the top 10 does not get the same amount of attention and that introduction of ads on top of the SERPs and universal search results within the SERPs change the distribution of clicks among the top 10 results. That said, it is hard to find valuable and reliable data that confirms or negates these premises. In order for people to check it themselves, they need to control every site in the top 10 for a keyword that provides enough traffic for these measurements to be statistically significant. Furthermore, there would probably be need for at least another such setup from a different niche to confirm the validity of the results in the first niche. To summarize, it is close to impossible to produce such research with the means available to an average website owner. There are two ways that such researches can be done: one is by eye-tracking studies. In these studies, a group of people is fitted with an instrument that follows their eye movement and records them against what the examiners are seeing on the screen. It also records the clicks they do on websites and correlate that data with the “heatmaps” created through the eye tracking. For some more info on those studies and on their misgivings, check out this great post from 2006 by Bill Slawski. The second way is to get hold of the search engine log data that provides not only the identity of keywords that were searched and results that were clicked but also information about the position that a URL was located at when clicked. Luckily, there are both kind of data available. There are quite a few people out there interested in web usability and testing those concepts through eye tracking studies. As I mentioned in my Affilicon 2009 presentation, all of the major search engines cooperated with universities and conduct academic researches in order to investigate new concepts or improve the existing ones As for the search engine data, remember AOL data dump of 2006 ? So apparently that dataset included all of the data needed for estimating the number of clicks each website would get if it was located in a different position on SERPs. In this post I will try and summarize several such researches, spanning the time from 2005 till 2008. Only the 2006 study is based on the user data accidentally released by AOL and the remaining studies are done by the eye-tracking technology. They are all investigating the distribution of clicks each of the top 10 results on Google gets. It is interesting that one of the researchers signing on the majority of the eye tracking studies is Laura A. Granka. She did her PhD in Communications at Stanford and has been in the User Experience Team at Google since 2005. Notice that the above dates are dates of publication, not necessarily the dates when the study was done. It is obvious that the vast majority of users click on the first 3 results (60-80%) and that anything below these positions will bring low to negligent traffic. These results should make us consider the overall optimization tactics – instead of massive investment into links for the sake of promotion of a few highly searched keywords with high competition; it may be worth our while to go for the long-tail traffic with almost certain top 3 positions through concerted efforts in wide scope content creation, site architecture optimization, deep linking, etc. Obviously, the shape of the above curves will depend on the nature of the search query, nature of the target audience and the data should also be cross-compared with the expected ROI from each term. There is a very clear difference between the data in 2008 and the previous years – there seems to be a sharp shift of the majority of users towards the top 3 positions, making the above described differences even sharper. 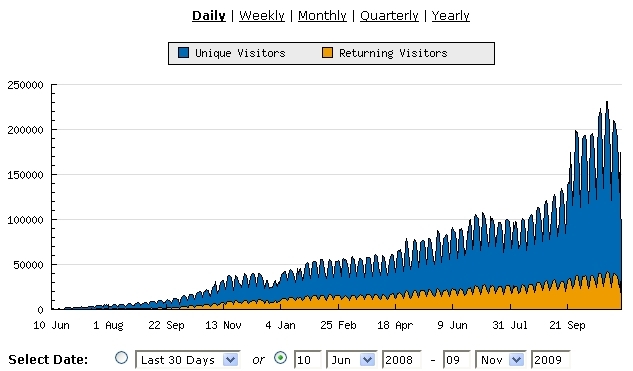 There is also a spike in users that click on the bottom results in the 2008 data. This can be explained by the introduction of universal/blended search results – video, news and image results. By being visually different, these results will naturally draw more clicks than the bland organic listings. Furthermore, an additional research done by the iProspect company shows that 36%, 31% and 17% of users click on the Image, News and Video results respectively. 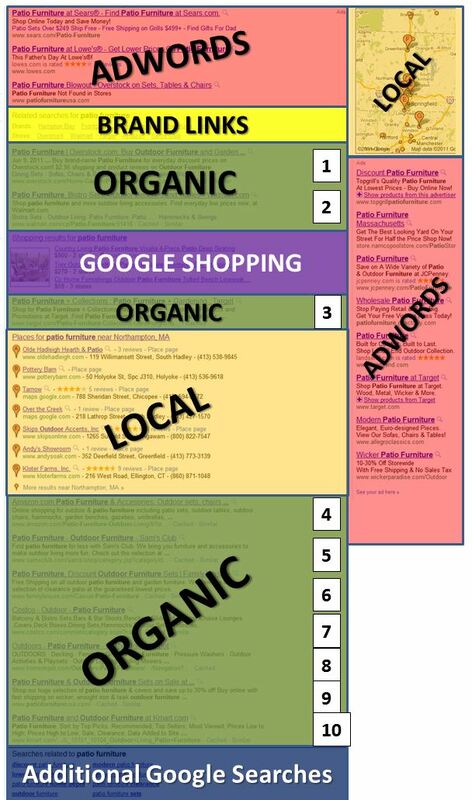 This should point towards possibilities of inserting content into those three categories of results and thus capitalizing on more SERP real estate. There also seems to be a pronounced difference between the 2004 data and the later studies – there seems to be a much more pronounced gravitation of users towards the #1 position than in the following years. In order to understand the reason for this we should look in the way the research was conducted (was there any difference in the methods, was there a pronounced difference in the queries that the test subjects used, etc.). However, we can speculate on some other explanations, such as possible higher quality of SERPs in those years which brought more relevant results in top position for more searches than in the later years when more users had to click to lower-ranking results since the top-ranking sites did not offer the best match to what they were searching for. Connect your Blackberry Bold through the USB and start the Desktop Manager app (came with your phone). Without the Desktop Manager running, you will not be able to connect to the internet. Go to Control Panel -> Phone and Modem Options -> "Modems" tab. 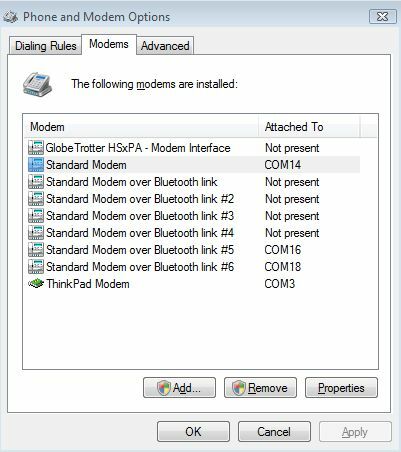 You should be able to see a list of all the modems you ever installed on your computer. Blackberry modem should be marked as a Standard Modem on COM14 or COM16. Notice how all the other standard modems are Bluetooth modems. I am guessing that Blackberry can serve as a modem even over Bluetooth, but have not checked this. Now go to your Network Connections and create a new connection (Setup a New Connection on Vista). 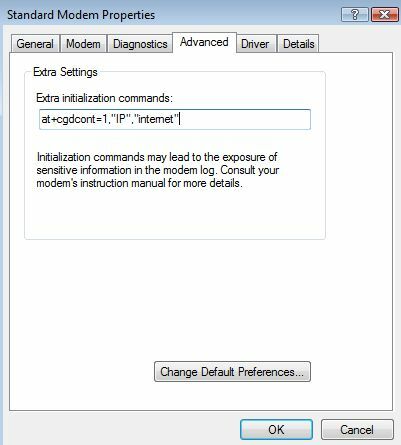 Choose Setup a Dialup Connection and pick the Standard Modem (not the bluetooth one). No username or password are needed. Go to the list of your network connections, right click the new connection you created and click on Properties. Go to Networking tab, pick the TCP/IP protocol (on Vista this is the TCP/IPv4 protocol) and click on Properties. Click on Advanced. 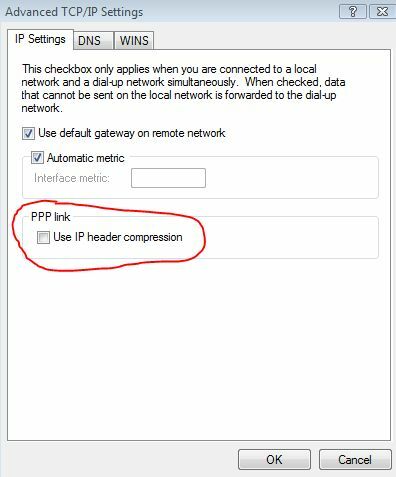 Uncheck the "Use IP Header Compression" checkbox (marked in red in the below picture). That is about it. Before connecting, make sure that you have 3G network enabled on your Blackberry. I personally disable 3G since it devours my battery within like 6 hours. The connection speed that I measured was something under 2Mbps download, which is not bad at all. I also managed to use my VPN client and have yet to find a significant difference between this connection and the regular WiFi connection. I’m sure that not everyone will manage to connect smoothly with just following the above instructions, but I am hoping that at least some will get some benefit from them. in case you hit some bumps, let me know in the comments.